Swimming with your baby can be relaxing and fun, encouraging physical activity and experiencing aquatic environments. Basic swimming fundamentals can also keep babies safer; some swimming safety classes start as early as infancy. Adults, children and babies experience water temperatures differently, so your baby might be uncomfortable even if the water feels fine to you. Temperatures that are too low or too high could be dangerous for your baby. Babies younger than 2 might require additional considerations when beginning swimming lessons, according to the University of Florida. Check for ideal temperatures by feeling the water yourself rather than just relying on a pool thermometer, since these could be inaccurate or broken. Most swimmers prefer a water temperature of 70 degrees Fahrenheit or higher, finding lower temperatures to be too cool, according to KidsHealth.org. However, babies prefer warmer temperatures. Swimming temperatures for children should range between 82 degrees and 86 degrees Fahrenheit; babies prefer the higher end of this range. BabySwimming.com states that ideal temperatures for swimming with babies range from 90 degrees to 92 degrees Fahrenheit, although lower temperatures might be acceptable if the day is quite warm -- for example, if outside temperatures are 80 degrees Fahrenheit or higher. Babies can wear swimming gear designed for additional warmth, if parents are concerned about being too cool. 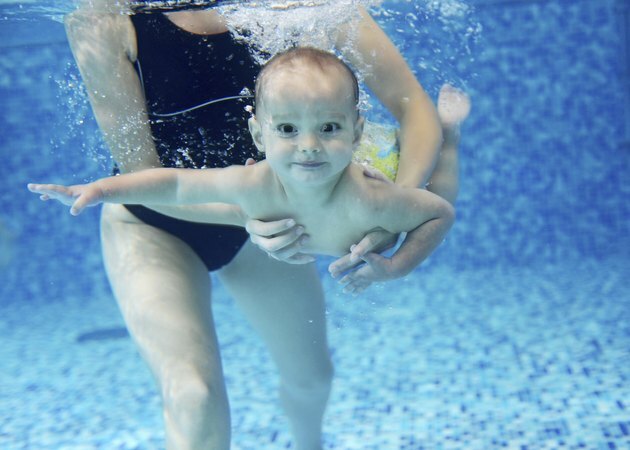 Wetsuits and latex or silicone swimming caps can help babies stay warm, but these don’t replace the importance of warm pool water, according to BabySwimming.com. On cooler days, keeping your baby’s shoulders beneath the waterline will help keep her warmer. If you observe your baby shivering, or if she seems to be experiencing muscle cramps, remove her from the water immediately. Body temperatures drop more quickly in water compared to land, according to KidsHealth.org, so act quickly to prevent hypothermia. When leaving the heated pool, promptly dry, warm and clothe your baby since the outside air might feel substantially cooler to her skin, according to Swimming.org. After a swim, sometimes the steam rising from a nearby hot tub might seem appealing for parents and kids. However, hot temperatures can be equally dangerous. Although hot tubs might seem like fun places to practice swimming with babies given their small size and shallow depth, the extreme temperature is unsafe, especially for extended periods. Keep hot tub temperatures set to 104 degrees Fahrenheit or lower for child safety, and don’t permit them to remain in the water for more than five minutes. Babies shouldn’t enter hot tubs with temperatures exceeding 100 degrees Fahrenheit, according to ThermoSpas. Although warm water can make pools more comfortable for babies, excessive temperatures can lead to poor physical reactions like lightheadedness, muscle spasms or vomiting, according to CNN.com. However, these effects are more likely to occur during high-intensity swimming, such as racing or professional-level training. Warm water can also create circumstances for bacteria or diseases to breed, according to EHA Consulting Group Inc. Parents should watch their babies carefully for signs of illness or discomfort in the warm pool water. Interrupt a swimming lesson if you observe your baby reacting negatively. Thermo Spas: Is it Safe for Children to use a Hot Tub?